Looking for the perfect gift? You’re in the right place. Our Gift Card is perfect for spending at some of Britain’s best-loved restaurants, pubs, bars and hotels. Let your lucky recipient choose where they’d like to spend their Gift Card. 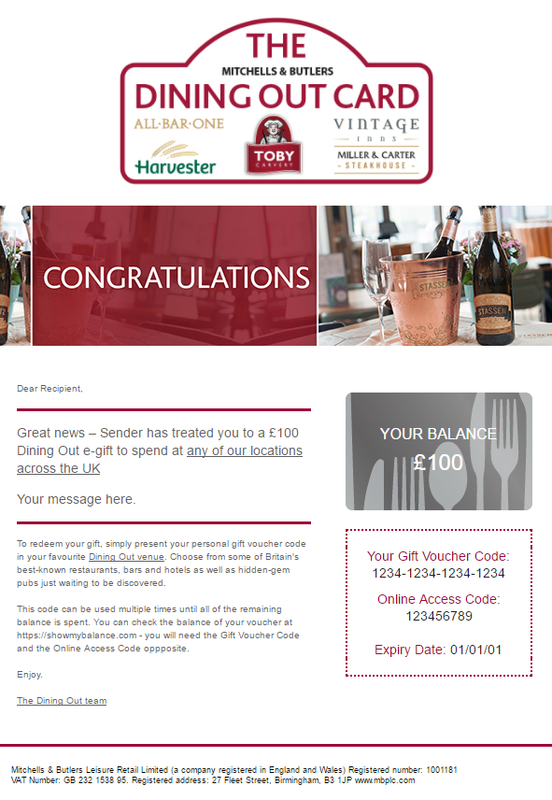 Whether it’s a steak at Miller & Carter, a few pints at their local pub or a Sunday roast at their favourite Toby Carvery, the Dining Out Card has got you covered. With over 1,500 eating and drinking experiences across the UK, what are you waiting for? You can search for your nearest venues here. You can also choose whether they receive their plastic gift card in the post or a digital gift code by email or text message. Just click on one of the options below to buy. WARNING: This delivery method chosen for this address can only accept a maximum of cards, there will be an additional postage charge incurred. Where can I buy Dining Out Card gift cards? Gift cards are available to purchase online. 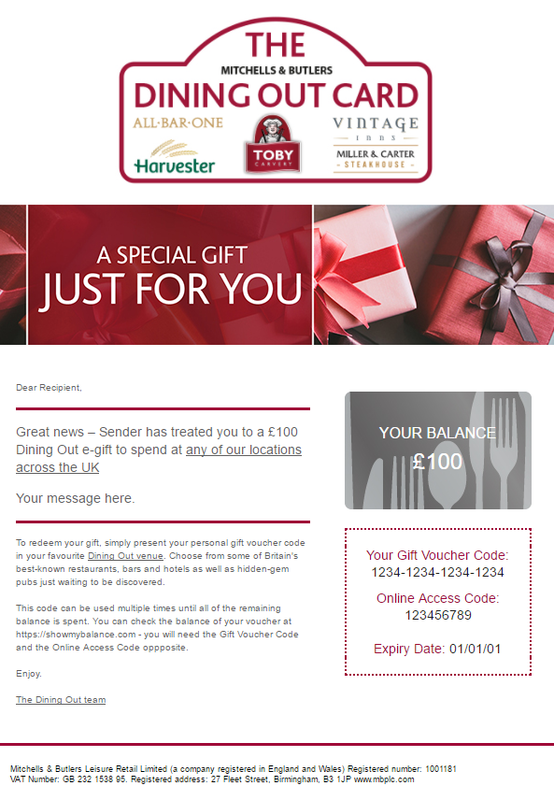 If you order online you can choose whether your gift card is received by email or by text message (e-gift). You can also buy plastic gift cards from our restaurants, pubs or bars. Just pop into your nearest Mitchells and Butler restaurant, pub or bar and speak to a team member. Fill out our enquiry form with your details and we'll respond to your query as soon as possible. Where can I spend Dining Out Card gift cards? 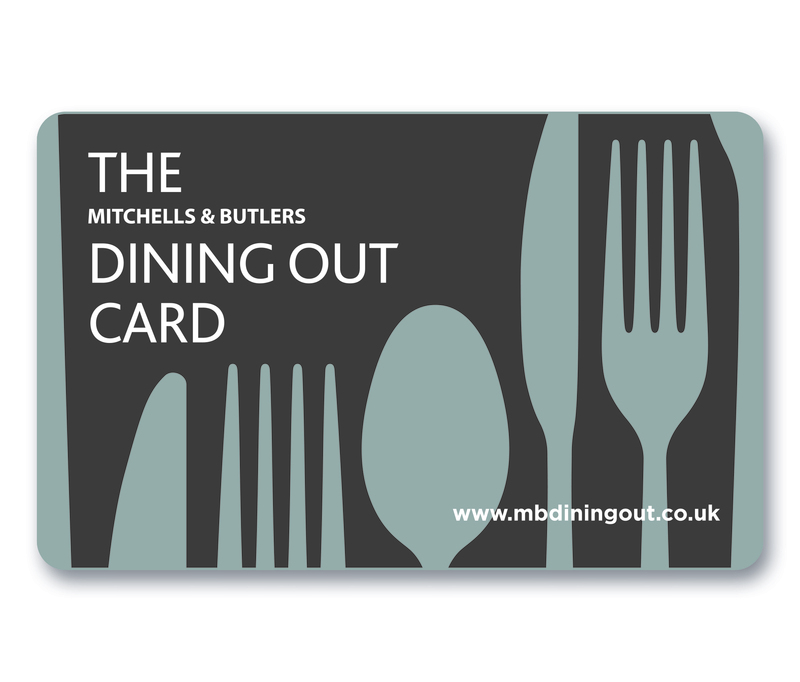 Dining Out Card gift cards (whether plastic, email or text message) are valid at any Mitchells & Butlers restaurant, pub, bar or Innkeeper's Lodge hotel in the UK. Find your nearest here. Fill out our enquiry form with details of your query and we will respond as soon as possible. Can I order large quantities of Dining Out Card gift cards? Certainly. Simply fill in the corporate gifts enquiry form and we will get back to you. Where can I find the Dining Out Card's terms and conditions? 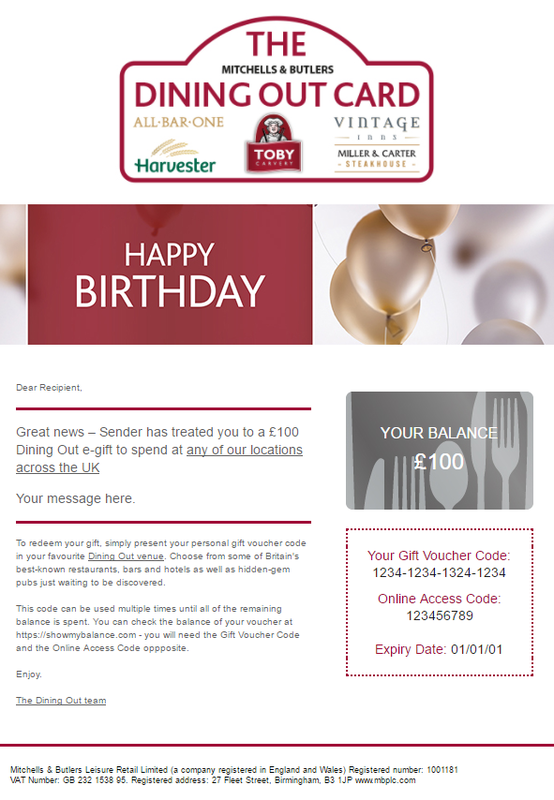 This website and orders for Dining Out Card gift cards made through the website are managed by our third party service provider, Eagle Eye Solutions Ltd., 5 New Street Square, London, EC4A 3TW, registered in England company number 04745717. The gift card customer is contracting with Eagle Eye Solutions Ltd. and the payment for the gift purchase will show as Eagle Eye Solutions Ltd. on the bank statement. Eagle Eye Solutions Ltd. will be responsible for gift card refunds. Contact support@eagleeye.com or call 0844 824 3699..